Save the date for the RHA Summer Cookout at Gillette Stadium! 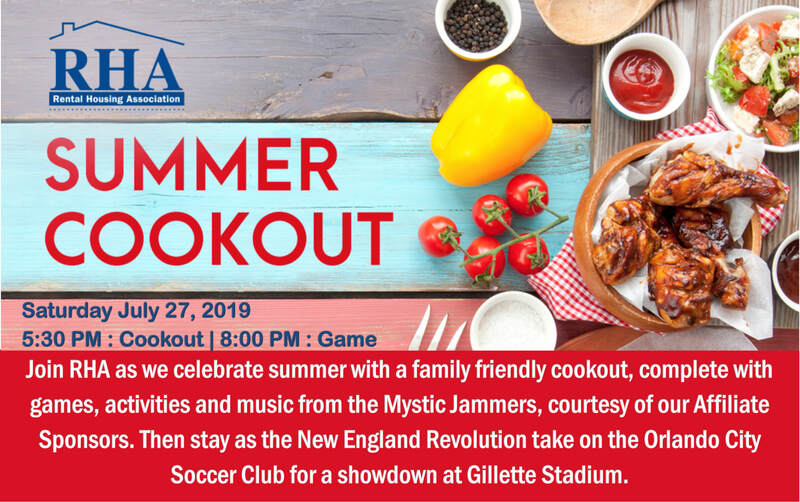 Enjoy food and fun hosted by our Affiliate members and watch the New England Revolution beat Orlando City! Contact Cam Archibald at carchibald@gbreb.com, 617-399-7868 with questions. The Rental Housing Association -Founded in 1953, RHA today represents owners and managers of some 150,000 units across the state. Whether you have a two-family house, manage a 200-unit condominium complex or manage a 500-unit apartment community, RHA can help you operate your business more effectively. Our members represent every facet of the industry: Apartment Owners, Property Managers, Condominium Managers, Subsidized Housing Owners, Developers of Rental and Condominium properties, Realtors, Brokers, Rental Agents, Service Providers (Affiliate Members).